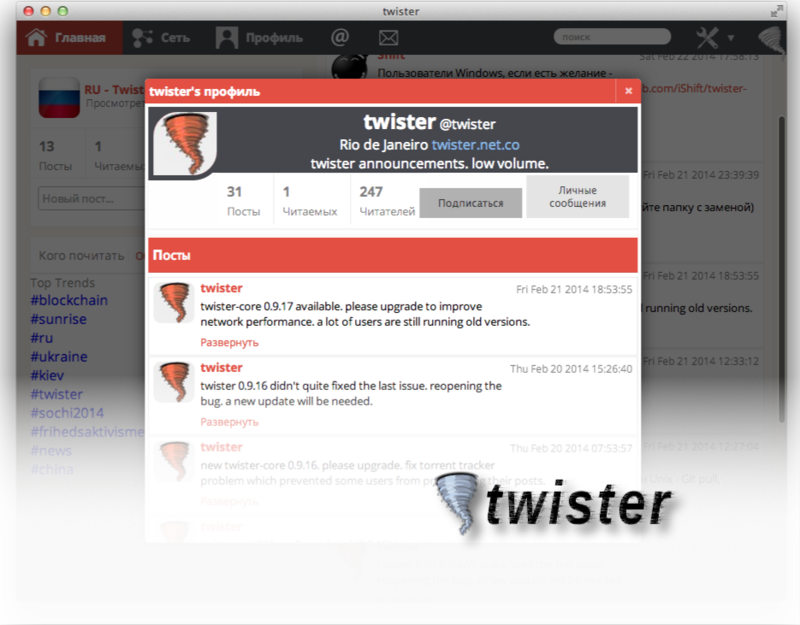 Twister is an open source, fully decentralized P2P (peer-to-peer) microblogging platform. It is based on both BitTorrent and Bitcoin-like protocols. Because Twister is completely decentralized, no one is capable of incapacitating Twister, since there is not a unique point of attack to the system. Private communication (direct messages) are protected with end-to-end encryption. Both content and metadata (i.e. the recipient address) are protected. Twister is designed to prevent other users from knowing your GSM location, IP address, and who you are following; hence, the IP address you use to access Twister is not recorded on any server. Your online presence is never announced. Learn more and download Twister here!